This one’s just for you, Happily Whole Members! Because I think it’s a super special treat and it’s for those of you willing to go above and beyond a little bit. It’s easy enough to make but requires a desire to make mealtime special. It calls for a little love and perhaps even an artistic flair. You see, even when it’s kept simple, food in an intriguing container appeals to the senses. So, stuffing a pretty little fall squash with a colorful, delicious flavor combination means tasteful temptation in the eye of the beholder. So, whether you’re impressing guests or you’re serving it up to your family, try this seasonal recipe for a nice change of pace on the plate. 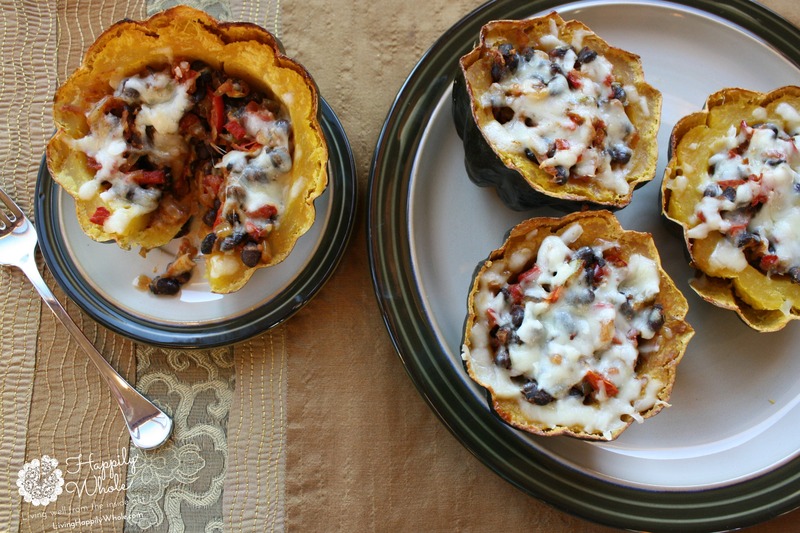 Stuffed with fiber, phytonutrients, a variety of vitamins (A, B and E) and minerals, this acorn squash meal makes the perfect fall dinner. It’s aesthetic enough for guests and simple enough to prepare to serve for the weekday family dinner. Its flavor combination and creaminess will not disappoint! Preheat your oven to 375 degrees F. Lightly coat a baking sheet with cooking spray or butter. Cut your squash in half lengthwise (see photo). 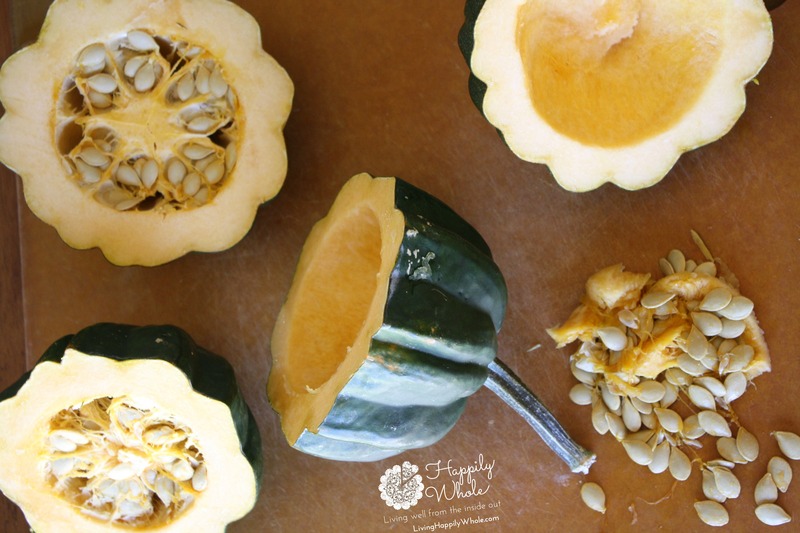 Scoop out the seeds and trim the bottom so that when you set your squash upright to fill, it will not wobble. Bake squash, flesh-side down, until tender, about 40 minutes and when you can stick it with a fork. Meanwhile, saute the onion and peppers in the ghee/butter. Add the garlic after a couple of minutes and continue to saute until the mix is slightly softened. Add the spices (chili powder, cumin, salt) to the saute pan. Stir in the tomatoes and black beans and the optional cayenne. Cover and cook a few more minutes until tomatoes are broken down. Stir in the nutritional yeast. About 7 minutes. Flip the squash over and let cool a few minutes. Divide the sauteed mixture between the squash halves, filling them almost to the top. Top them with the shredded cheese. 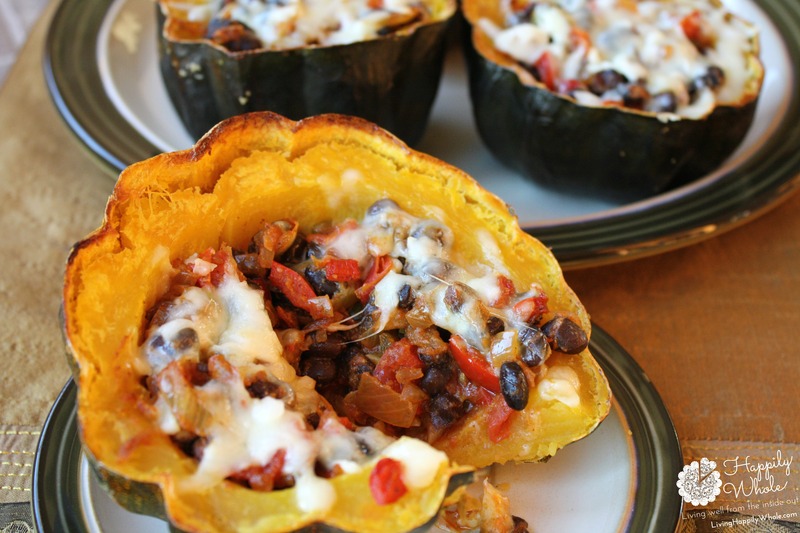 Bake the filled squash for about 10 to 15 minutes until cheese is well melted. *Nutritional yeast is a inactive yeast that contains tons of B vitamins, so especially good for those of us who don't eat a lot of animal products. It has a cheesy flavor and adds creaminess to a dish. **I like to use goat's cheese because it's casein free (free of a cow's dairy protein that many people have a difficult time digesting.) My next best cheesy choice is raw, cow's milk sharp cheddar. I prefer raw, unpasteurized whenever I can find it.